Chances are when you go to a grocery store, you use a shopping cart to help collect your goods. While you may not give the object a second thought, just think how hard it would be to have to physically carry all the items you want to buy with you throughout a store. That’s how it was for many back before shopping carts were invented. Luckily, that all changed. Take a look at the history of this convenient item that most of us take for granted today. In 1936, Sylvan Goldman, owner of a local Oklahoma Humpty Dumpty supermarket store, stumbled upon a problem when he noticed that his customers would go to a check-out line almost too soon. After pondering over the issue, he figured out the reason for this was that as soon as customers filled up their wire baskets, it became too heavy for them to carry around while shopping. To avoid the problem so he could keep the sales going, Goldman and one of his employees that served as a mechanic, Fred Young, teamed up to build what would be known today as the first shopping cart. Goldman was struck with inspiration for a shopping cart design when he found a wooden folding chair. After a few months of tinkering with different ideas, they settled on a metal frame design that held two wire baskets called “folding basket carriers.” In order to use a cart, the idea was to take a folded-up frame from a row. In the row, they were stacked side-by-side, and they were only 5″ wide in their folded form. Unfortunately, there wasn’t much storage space. After the shopper unfolded it, they would take two baskets and place them into two holders on the frame — one above and one below. Much to Goldman’s dismay, his new invention was not taking off as he expected. Men felt that the carts were effeminate and women thought they looked like baby carriages (something they were tired of pushing). Since it appeared that only the elderly were interested in his invention, Goldman hired attractive male and female models to use his carts inside the store and pretend to shop. He even had greeters at the door that would explain the function of the carts so people would feel more inclined to use them. Overtime, carts started to catch on with customers, so much so that Goldman’s invention turned him into a multimillionaire. In the 1950s, the shopping cart that we all know today (one big basket on wheels rather than two) was introduced. While there have been a few add-ons like baby seats, drink holders, plastic handles, and more space in the basket, the basic shopping cart design has not changed a whole lot since then. 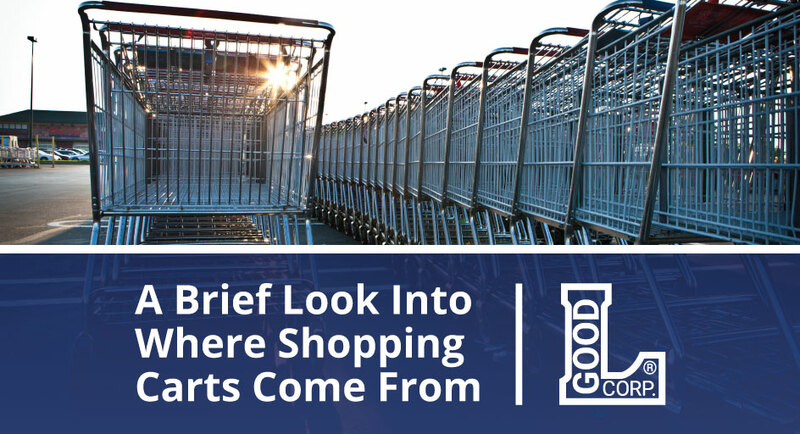 Good L Corporation provides businesses everywhere with the only American-made shopping carts. Contact Good L Corporation today for more information on adding shopping carts to your business. Checklist: Should You Replace Your Shopping Carts?